Look, £509 is a lot of money... unless you’re talking computers. Any computer you buy for that little is firmly a “budget” PC, as far as the people making them are concerned. They’re not impressive, or especially fast, or pretty. They’re purely functional—the Ford Fiesta of computers. The sheer mediocrity of the sub-£500 range of laptops is why the new £509 Microsoft Surface Go is so damn special. It’s a cheap laptop that’s actually nice. The machine currently comes in two flavors: a £379 version with 64GB of storage and 4GB of RAM, and the £509 version with 128GB of storage and 8GB of RAM. I reviewed the latter. 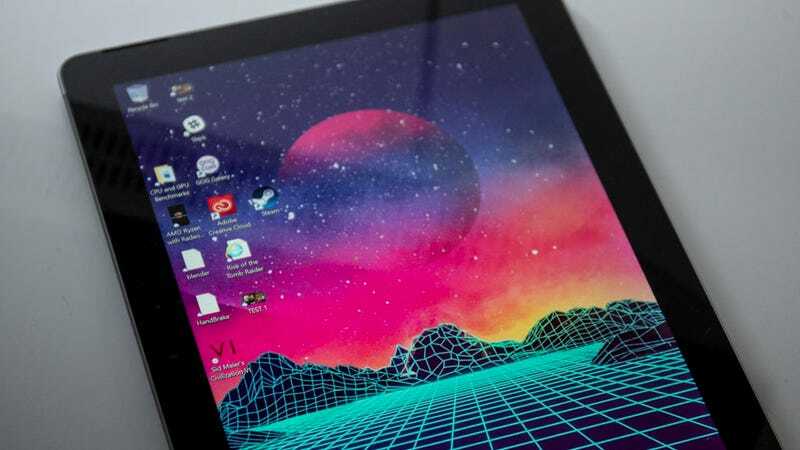 This 10-inch cousin to the much faster and larger Surface Pro will call to mind an iPad the first time you pick it up. 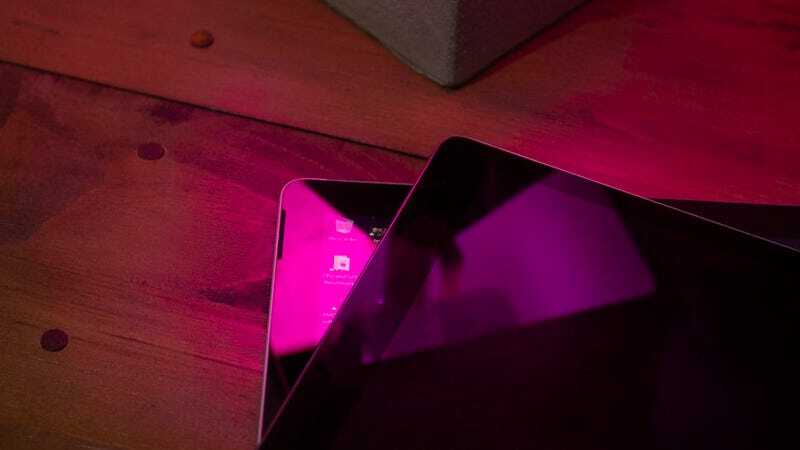 They’re both tablets first, with a minimal number of inputs (the Surface Go has one USB-C port, one 3.5mm audio port, and a Surface charging port), and they both have detachable keyboard covers. The Surface Go is about the same size as an iPad Pro, too—though it does weigh a fraction more. Because let’s be clear, you ain’t playing traditional PC games on the Surface Go. Microsoft claims it worked hard with Intel to optimise the performance of its Pentium 4415Y CPU, and I’ll admit that in simple activities like browsing and checking my email, the Surface Go feels as quick as a much more powerful device. But opening Photoshop quickly makes it apparent that the Surface Go has a very budget CPU baked into its tiny chassis. As does the result of our Photoshop test, where we resize and convert a series of RAW images to JPEG. 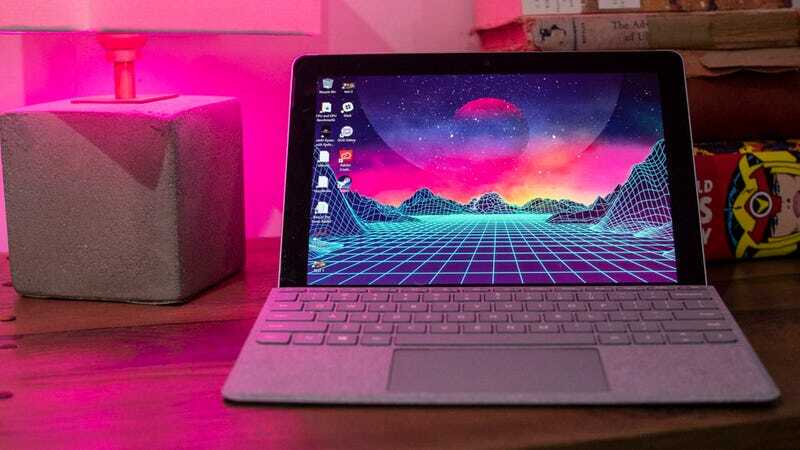 The Surface Go took 2 minutes and 27 seconds to accomplish the task. That’s more than a minute longer than any other laptop we’ve tested to date. What all those numbers mean is that this thing won’t be processing any big files or crunching large numbers anytime soon. Big PDFs and RAW images take a while to load. Sometimes the browser will get sluggish and toddle along from tab to tab. But it’s a £509 2-in-1 laptop. Some kind of tradeoff had to occur. 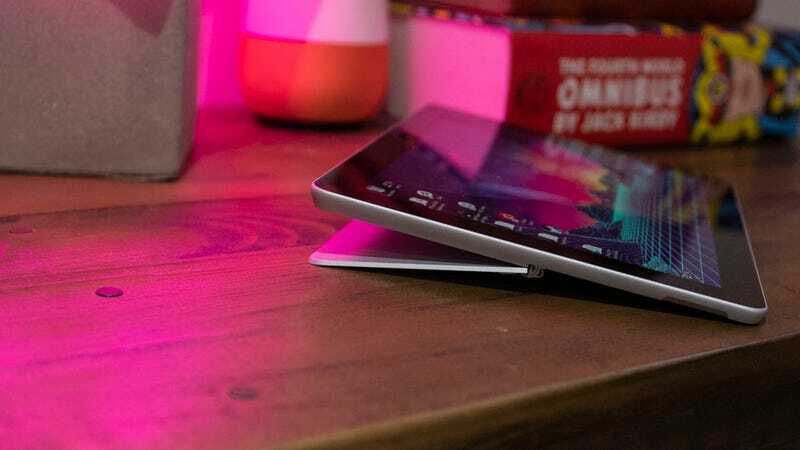 Yet the real coup de grace over the iPad, and indeed over any other 2-in-1 or tablet at this price range, is the hinge on the back of the Surface Go. 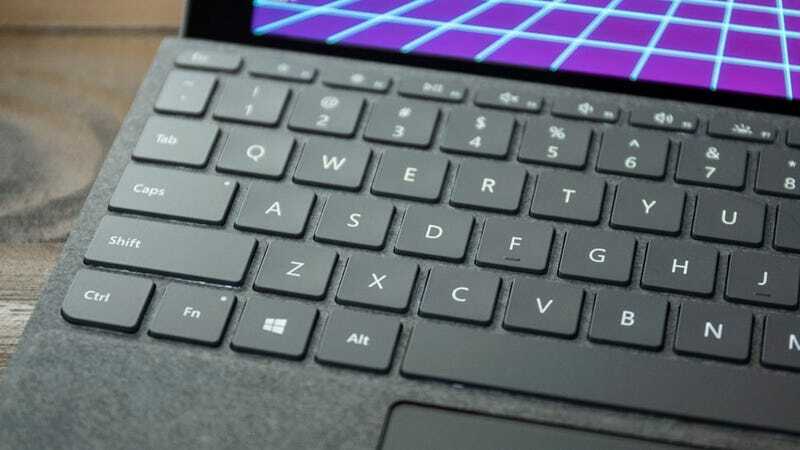 It’s the same hinge found in the Surface Pro and, as silly as it sounds, it’s a very good reason to buy the Surface Go. With my iPad, I have to precariously fold the cover if I want to give it tilt while reading on my bed. When I try to type with it in my lap, it inevitably collapses like a house of cards. The Surface Go, by comparison, feels almost as stable as an actual laptop. I never worry about it when I’m whipping up a piece, and I genuinely appreciate how many angles I can set it at when I’m watching a movie or reading a book. Often times when you’re buying a product at this price range, it feels like something within the body of the device has been sacrificed. 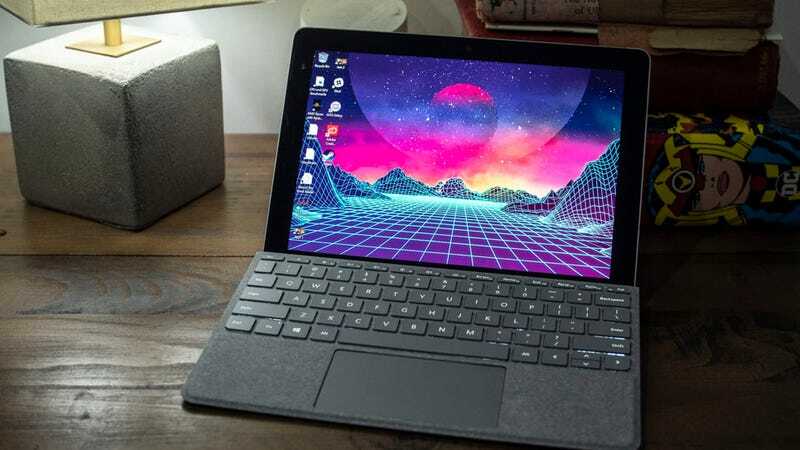 I’m not talking about the guts—the Surface Go’s guts are fairly typical for the sub-£500 range of devices. I’m talking about the design of the device. Until the Surface Go, the only cheap laptop with any pizzazz was the HP Stream and Samsung’s Chromebook Plus. Yet those devices still feel like they came off a shelf during Black Friday at Walmart. They’re cheap, and it’s apparent in the materials they’re made of. It starts at just £379!